The aim of this study was to evaluate the hepatoprotective effects of Alcea rosea against acetaminophen-induced hepatotoxicity in mice. Aqueous methanolic extract of A. rosea were given orally for 7 consecutive days followed by daily toxic dose of acetaminophen. At the end of treatment period, evaluation of hepatoprotective activity of A. rosea was done on basis of levels of liver enzyme markers (aminotransferases, alkaline phosphatase and bilirubin) and histopathological examination of liver tissues. Acetaminophen significantly increased serum levels of liver enzyme markers whereas, the extract of A. rosea significantly reduced serum levels of elevated liver enzyme markers in dose-dependent manner compared to acetaminophen treated mice group. Histopathological examination of liver tissues also supported the protective effects of A. rosea on liver enzyme markers. We conclude that extract of A. rosea has strong hepatoprotective effects against acetaminophen-induced hepatotoxicity; thereby, affirming its traditional therapeutic role in liver injury. Ahmadi M, Rad AK, Rajaei Z, Hadjzadeh MAR, Mohammadian N, Tabasi NS. Alcea rosea root extract as a preventive and curative agent in ethylene glycol-induced urolithiasis in rats. Indian J Pharmacol. 2012; 44: 304-07. Akash MSH, Rehman K, Rasool F, Sethi A, Abrar M, Irshad A, et al. Alternate therapy of type 2 diabetes mellitus (T2DM) with Nigella (Ranunculaceae). J Med Plants Res. 2011; 5: 6885-89. Akash MSH, Rehman K, Chen S. Effects of coffee on type 2 diabetes mellitus. Nutrition 2014a; 30: 755-63. Akash MSH, Rehman K, Chen S. Spice plant Allium cepa: Dietary supplement for treatment of type 2 diabetes mellitus. Nutrition 2014b; DOI: 10.1016/j.nut.2014.02.011. Akhtar MS, Asjad HMM, Bashir S, Malik A, Khalid R, Gulzar F, Irshad N. Evaluation of antioxidant and hepatoprotective effects of Khamira Gaozaban Ambri Jadwar Ood Saleeb Wala (KGA). Bangladesh J Pharmacol. 2013; 8: 44-48. Alamgeer, Nawaz M, Ahmad T, Mushtaq MN, Batool A. Hepatoprotective activity of Thymus linearis against paracetamol and carbon tetrachloride and carbon tetrachloride-induced hepatotoxicity in albino mice. Bangladesh J Pharmacol. 2014; 9: 230-34. Ali M, Qadir MI, Saleem M, Janbaz KH, Gul H, Hussain L, Ahmed B. Hepatoprotective potential of Convolvulus arvensis against paracetamol-induced hepatotoxicity. Bangladesh J Pharmacol. 2013; 8: 300-04. Bag AK, Mumtaz SMF. Hepatoprotective and nephroprotec-tive activity of hydroalcoholic extract of Ipomoea staphylina leaves. Bangladesh J Pharmacol. 2013; 8: 263-68. Balamurugan G, Muthusamy P. Observation of the hepatoprotective and antioxidant activities of Trianthemadecandra Linn. (Vallaisharunnai) roots on carbon tetrachloride-treated rats. Bangladesh J Pharmacol. 2008; 3: 83-89. Bhaskar V, Balakrishnan N. Protective effects of Pergularia-daemia roots against paracetamol and carbon tetrachloride-induced hepatotoxicity in rats. Pharm Biol. 2010; 48: 1265-72. Duke JA, Ayensu ES. Medicinal plants of China. Reference Publications Algonac, MI, 1985. p 398. Ghaoui WBJE, Ghanem EB, Chedid LA, Abdelnoor AM. The effects of Alcea rosea L., Malva sylvestris L. and Salvia libanotica L. water extracts on the production of anti?egg albumin antibodies, interleukin?4, gamma interferon and interleukin?12 in BALB/c mice. Phytother Res. 2008; 22: 1599-604. Hegde K, Joshi AB. Hepatoprotective and antioxidant effect of Carissa spinarum root extract against CCl4 and paracetamol induced hepatic damage in rats. Bangladesh J Pharmacol. 2010; 5: 73-76. Huang B, Ban X, He J, Tong J, Tian J, Wang Y. Hepatoprotec-tive and antioxidant activity of ethanolic extracts of edible lotus (Gaertn.) leaves. Food Chem. 2010; 120: 873-78. Hussain L, Ikram J, Rehman K, Tariq M, Ibrahim M, Akash MSH. Hepatoprotective effects of Malva sylvestris L. against paracetamol-induced hepatotoxicity. Turk J Biol. 2014; 38: 396-402. Ibrahim M, Hussain N, Akash MSH, Imran M, Aslam M, Hussain A, et al. Acetyl and butyryl cholinesterase inhibitory sesquiterpene lactones from Amberboaramosa. Chem Cent J. 2013; 7: 116. Khan AZ, Mohammad A, Iqbal Z, Anis I, Shah MR, Nadeem S, Rabnawaz M, Shahidullah A, Khan H, Khan I. Molecular docking of viscosine as a new lipoxygenase inhibitor isolated from Dodonaea viscose. Bangladesh J Pharmacol. 2013; 8: 36-39. Kulkarni G, Gowthamarajan K, Satish Kumar M, Suresh B. Gums and mucilages: Therapeutic and pharmaceutical applications. Nat Prod Rad. 2002; 1: 10-17. Mert T, Fafal T, K?vçak H, Ozturk T. Antimicrobial and cytotoxic activities of the extracts obtained from the flowers of Alcea rosea L. Hacet Univ J Pharm. 2010; 30: 17-24. Munir M, Hussain A, Ul-Haq I, Qureshi R, Munazir M, Rshad M, et al. Callogenesis potential of cotyledonary explants of Althaea rosea. from Pakistan. Pak J Bot. 2012; 44: 271-75. Nayak SS, Jain R, Sahoo AK. Hepatoprotective activity of Glycosmis pentaphylla against paracetamol-induced hepatotoxicity in Swiss albino mice. Pharm Biol. 2011; 49: 111-17. Parveen A, Akash MSH, Rehman K, Mehmood Q, Qadir MI. Analgesic, anti-inflammatory and anti-pyretic activities of Caesalpinia decapetala. Bioimpacts 2014; 4: 43-48. Qadir MI, Ali M, Ali M, Saleem M, Hanif M. Hepatoprotective activity of aqueous methanolic extract of Viola odorata against paracetamol against paracetamol-induced liver injury in mice. Bangladesh J Pharmacol. 2014; 9: 198-202. Qadir MI, Murad MSA, Ali M, Saleem M, Farooqi AA. Hepato-protective effect of leaves of aqueous ethanol extract of Cestrum nocturnum against paracetamol-induced hepatotoxicity. Bangladesh J Pharmacol. 2014; 9: 167-70. Rehman JU, Saqib NU, Akhtar N, Jamshaid M, Asif HM, Sultana S, Rehman RU. Hepatoprotective activity of aqueous-methanolic extract of Suaeda fruticosa in paracetamol-induced hepatotoxicity in rabbits. Bangladesh J Pharmacol. 2013; 8: 378-81. Rehman K, Akash MSH, Azhar S, Khan S, Abid R, Waseem A, Murtaza G, Sherazi TA. A biochemical and histopathologic study showing protection and treatment of gentamicin-induced nephrotoxicity in rabbits using vitamin C. Afri J Trad Complement Alt Med. 2012; 9: 360-65. Rehman K, Javed Iqbal M, Zahra N, Akash MSH. Liver stem cells: From preface to advancements. Curr Stem Cell Res Ther. 2014; 9: 10-21. Sabir S, Rocha J. Water-extractable phytochemicals from Phyllanthus niruri exhibit distinct in vitro antioxidant and in vivo hepatoprotective activity against paracetamol-induced liver damage in mice. Food Chem. 2008; 111: 845-51. Saboo SS, Tapadiya G, Farooqui IA, Khadabadi SS. Free radical scavenging, in vivo antioxidant and hepatoprotective activity of folk medicine Trichodesma sedgwickianum. Bangladesh J Pharmacol. 2013; 8: 58-64. Sadeque MZ, Begum ZA. Protective effect of dried fruits of Carica papaya on hepatotoxicity in rat. Bangladesh J Pharmacol. 2010; 5: 48-50. Saleem M, Ahmed B, Karim M, Ahmed S, Ahmad M, Qadir MI, Syed NI. Hepatoprotective effect of aqueous methanolic extract of Rumex dentatus in paracetamol-induced hepato-toxicity in mice. Bangladesh J Pharmacol. 2014; 9: 284-89. Saleem M, Ahmed B, Qadir MI, Karim M, Rafiq M, Ahmad M, Ahmad B. Hepatoprotective effect of Chenopodium murale in mice. Bangladesh J Pharmacol. 2014; 9: 124-28. Sharma SK, Arogya SM, Bhaskarmurthy DH, Agarwal A, Velusami CC. Hepatoprotective activity of the Phyllanthus species on tert-butyl hydroperoxide (t-BH)-induced cytotoxi-city in HepG2 cells. Pharmacogn Mag. 2011; 7: 229-33. Thakare SP, Jain HN, Patil SD, Upadhyay UM. Hepatoprotec-tive effect of Cocculus hirsutus on bile duct ligation-induced liver fibrosis in albino Wistar rats. Bangladesh J Pharmacol. 2009; 4: 126-30. Valan M, Britto A, Venkataraman R. Phytoconstituents with hepatoprotective activity. Int J ChemSci. 2010; 8: 1421-32. Venkatesh P, Dinakar A, Senthilkumar N. Hepatoprotective activity of ethanolic extract of the stems of Anisochilus carnosus against carbon tetrachloride-induced hepatotoxicity in rats. Int J Health Res. 2010; 3: 179-83. Wang D, Shang J, Yu Q. Analgesic and anti-inflammatory effects of the flower of Althaea rosea (L.) Cav. Zhongguo Zhong Yao Za Zhi. 1989; 14: 46-48. Hussain, L., M. S. Akash, M. Tahir, K. Rehman, and K. Ahmed. 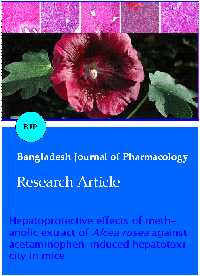 “Hepatoprotective Effects of Methanolic Extract of Alcea Rosea Against Acetaminophen-Induced Hepatotoxicity in Mice”. Bangladesh Journal of Pharmacology, Vol. 9, no. 3, July 2014, pp. 322-7, doi:10.3329/bjp.v9i3.19068.